The PWG oscillator offers real-time waveform generation with ‘elastic’ Pulse Width Modulation. The upper and lower halves of the waveform will contract and expand in opposition to each other, depending on the position of the SHAPE control, or through LFO/envelope modulation. This leads to a unique PWM-effect that works on any waveform, including a sine wave. The upper and lower waveform shapes are controlled independently – the upper waveform is adjusted with SHIFT_SHAPE, and the lower waveform with EDIT. As the control is changed, the half-wave changes from a squeezed-sine wave, through sine (at the mid-way value of 50), and then towards square/saw. The combination of the above parameters generates a waveform in real time with no lookup tables or interpolation, operating directly on the sine-based waveform algorithm. The signal is then fed through one of two waveshapers/folders to add new harmonics, with a manual ‘fold’ control setting the base wavefold amount EDIT, and various options described below for envelope and LFO modulation. The PWG envelope is a simple AD-type (attack and decay) with a ‘modulation amount’ control. The envelope can be positive or negative, with a value of 50 having no effect. This envelope, and the Prologue LFO can modulate the elastic PWM mid-point, or the waveshaping amount, depending on the ‘mod mode’ selected as per the parameter list below. This allows for different combinations of modulation sources and destinations for PWM and wavefolding, creating many interesting variations and colours. 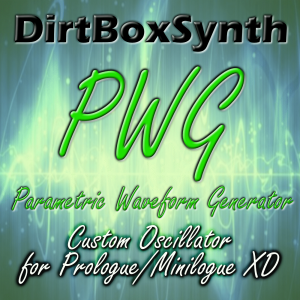 The PWG oscillator is great for pads, basses, arps and leads, and offers a unique sound palette using real time waveform generation and manipulation.